Max. Length : 18 Ft.
- For the treatment of wood from termites and other pests which make the wood weaker. Fero Mecha Equipment Process Pvt. Ltd. Features: Treatment for enhance the life of Wood. Application: Wood treatment by different chemical/preservatives. By treating Wood we can increase life & stability of wood. We are offering to our clients Bamboo Treatment Plant which are used in various industries. These are provided to our clients in various capacities to suit the varied requirements of our clients. 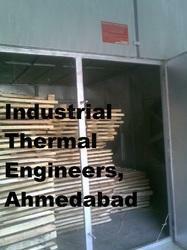 We are into Wood Heat Treatment to process all wood based packing materials. The heats the material to 59 degrees and maintains the temperature for a minimum of 30 minutes. This effectively kills any bugs, termites or weevils that may have embedded themselves within the material. Matching up with the requirements of our clients, we are involved in offering Wood Treatment Plant.